On the toolbar, click the Create a Turtle button. Move into the workspace and click to hatch a turtle. Drag this traffic turtle into a lane. 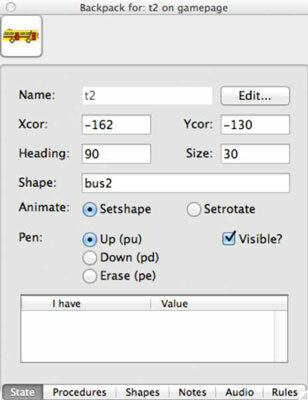 Look at the clip art in the Painting/Clipart palette by clicking the Singles button or the Animation button. Click on a vehicle shape (a car, a bus, or even an elephant!) and then move into the workspace and click on the traffic turtle. The turtle now wears the vehicle shape. Close the Painting/Clipart palette by clicking its X button. Next, set the turtle heading so that the vehicle matches the direction in which the shape is pointing. Right-click (Windows) or Ctrl-click (Mac) on the traffic turtle and select Open Backpack from the pop-up menu. On the backpack State tab, type in a number for the Heading. For east, the heading is 90. For west, the heading is 270. For the example, set the heading to 90. With the backpack still open, set the size of the vehicle. In the Size field, type in a number less than 40 to shrink the vehicle. Type in a number greater than 40 to grow the vehicle. The default size of a turtle is 40. For the example, enter 30 for the size. Click the vehicle shape thumbnail in the upper-left corner of the turtle backpack to apply a change and see the effect of the change. Make a few copies of your traffic turtle as follows. Right-click (Windows) or Ctrl-click (Mac) the traffic turtle and select Copy from the pop-up menu. Click on the background and select Paste from the pop-up menu. A copy of your traffic turtle appears. Click Paste again to drop another traffic turtle on the background. Repeat three or four times to add several copies of traffic turtles to the lane. Click and drag the traffic turtles, one at a time, into positions that mimic vehicles in a lane. The spacing can be even or uneven, your choice! Repeat Steps 1–11 to create additional lanes of traffic. Be sure to form lanes of traffic moving in both directions, and set the headings of the vehicles to match their directions of movement. 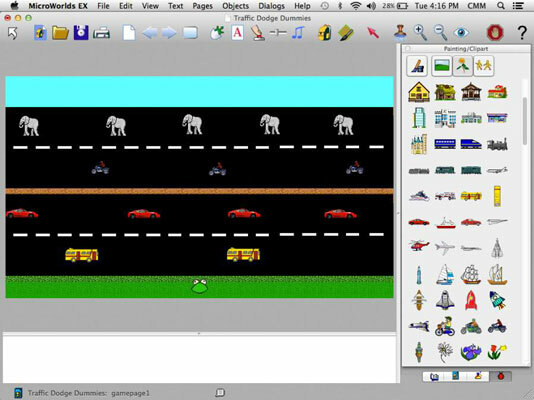 You can see four lanes of traffic in Level 1 made up of elephants, motorcycles, race cars, and buses. Freeze your frog turtle and your traffic turtles to prevent the player from clicking them and moving them during the game. Right-click (Windows) or Ctrl-click (Mac) each turtle and then select Freeze from the pop-up menu.